Scent your house naturally without using expensive essential oils by using produces commonly found in your spice rack, garden, and refrigerator. Essential oils are all the rage these days. A few drops and you have an explosion of taste or smells… but at a premium price. Not only are essential oils pretty pricey by the ounce, they require forethought to purchase. Ummm that is sorta my sticking point. I’d actually have to remember to buy essential oils in order to use them. A few weeks ago Hubby was cooking. Now my Hubby is the cook in our family. I bake, he cooks, and he truly is an excellent cook. But apparently that Saturday he was having an off day, because suddenly the kitchen filled with smoke, and the smoke alarms started blaring. After I got off the phone with the alarm company, I noticed a lovely grey haze hanging over the kitchen. While we opened doors to facilitate the disbursement of that smoke, we don’t have a great cross breeze in our house. That meant the joint stunk. Now aerosol sprays are fine and dandy, but this was a stench that wasn’t going to give in to a few quirts from a Lysol can. So what to do? Well, I frequently boil water on the stove and then add spices, citrus and/or flowers, and then turn down that pot to a simmer to make the whole house smell marvelous! • Note: watch the water in the pot so it doesn’t boil out. I’ve done that before – not good. Just add more water if you want to simmer your scents longer, or call it a day if your house smells great. The scent in the water permeates the house chasing away the stink, and giving the house a wonderful, seasonal smell. You can change with the seasons: flowers in the spring or summer, spices in the fall and winter, and use citrus for a change of pace! • You can add vanilla, anise, lemon, peppermint extracts, but don’t add them by themselves, use them with the spices to help bring out their full potential. Experiment and combine scents. Sometimes a scent is too strong on its own, or not strong enough, and a second (or third) natural addition just makes the pot smell fabulous! Honestly this is my go-to way to scent (and de-stink) my house, and has been for over 30 years now. My favorite “recipe” is adding 3 cinnamon sticks and 6-8 whole cloves to the boiling water. I do this spring, winter and fall because I absolutely love the smell of cinnamon – it reminds me of baked goods! 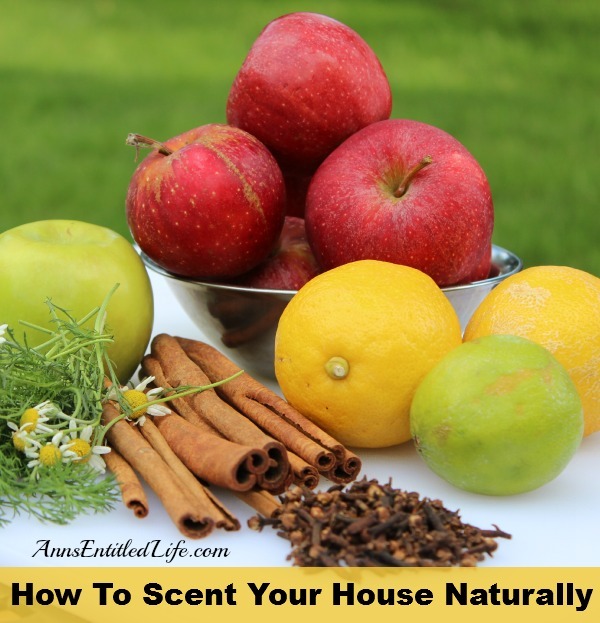 Do you have a favorite scent your house naturally “recipe”!? If so, please share!